Do you struggle with what to bring for lunch? Mason jar salads can be prepped ahead of time and stored in your refrigerator. This makes them the perfect work week lunch idea! Do you often skip lunch while at work? Or do you end up just snacking on something unhealthy? Or what about running to the drive through ‘just this one time’? And we all know that ‘one time’ can easily turn into repeats. 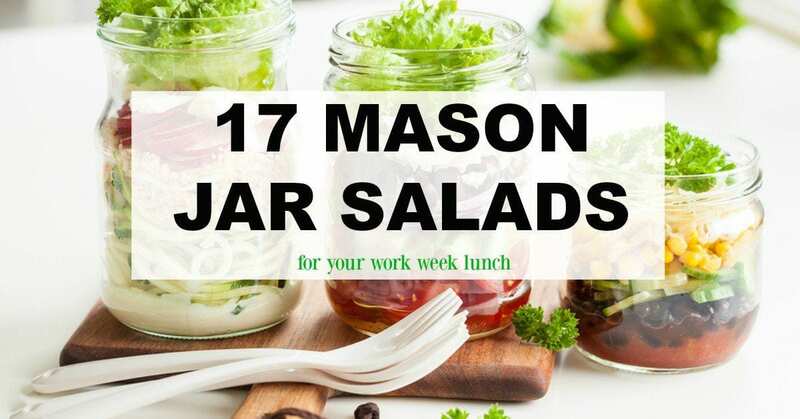 If you’re trying to eat healthier, cut down on lunch expenses or both, mason jar salads might be exactly what you’re looking for. And the perfect thing about these is you can add exactly what you like. Before we get into the recipes I’ve rounded up, let’s go over some of the basics of creating a really good mason jar salad. You don’t just pile everything into the jar and call it good. Nope. There’s a science to it. Or more like an order to it. The basics of a perfect mason jar salad are to layer the heavier ingredients on the bottom and ending with your greens on top. This keeps the greens from getting soggy. The heartier veggies can handle being on the bottom and closer to the dressing. Salad Dressing: depending on how much salad dressing you like, you’ll put anywhere from 1 to 3 Tablespoons of dressing on the bottom of your mason jar. Hard Vegetables: These include veggies such as carrots, peppers, red onions, and cucumbers. This layer protects the other ingredients from getting soggy. Beans, Grains, Pasta & Softer Veggies: Next goes in anything like black beans, pasta, rice, mushrooms, corn, or broccoli. Cheeses and Proteins: Only add these ingredients next if you’re planning on eating your salad within a day. If you’re prepping for the week, leave both of these ingredients out and top your salad with them after you’ve poured it out into a bowl. Greens and Nuts: The last layer is your greens, like spinach, kale and lettuce and any nuts you’d like to add. Now seal it up and you’re good to go! To eat, just shake it up and pour it into a bowl. What Size Canning Jars Should You Use? For best results, go with a jar that has a wide mouth. It will make it easier to get the ingredients in the jar, as well as out of the jar. I recommend using a quart size canning jar. These are the perfect size for a lunch or dinner time salad. How Long Do Salads in a Jar Last? 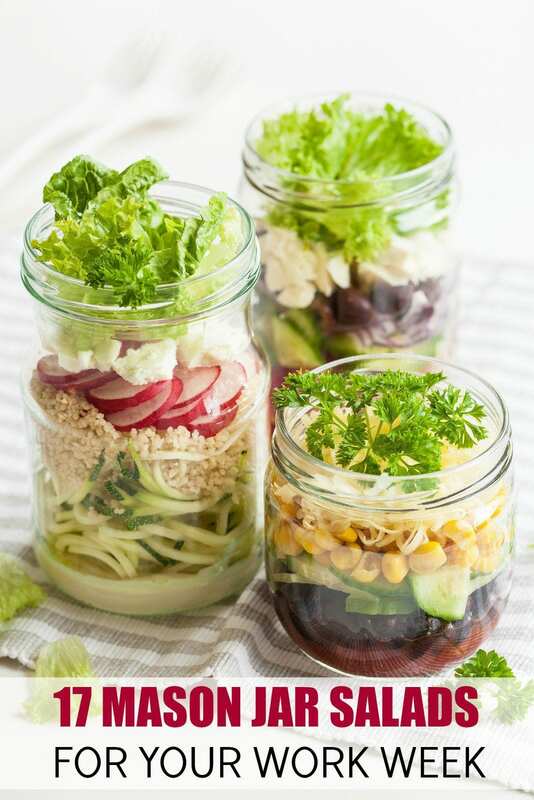 If the lid is sealed tightly and stored in the fridge, Mason Jar Salads can last up to five days. But remember, there are certain ingredients like hard-boiled eggs, cheeses, and proteins that won’t last that long. If you’re new to making mason jar salads, I would recommend starting with just 3 days worth and test the ingredients out for a bit. How Do You Make a Salad Dressing? For more dressing recipes and mason jar salad recipes that go above and beyond your basic green salad, Mason Jar Salads: 50 Layered Lunches to Grab & Go is a fantastic book. Just looking at the cover makes me hungry! Next article5 Steps to Starting Your Side Business + A Giveaway!